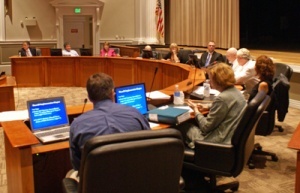 The Albemarle County Planning Commission is a seven-member body that provides guidance to the Board of Supervisors on issues of planning and development. Six of its members serve four-year terms and are appointed by each member of the Board of Supervisors. A seventh is elected at-large and serves a two-year term. One member is selected among the commissioners to serve as chair. Magisterial District Planning Commission members are appointed for four-year terms, while the at-large member and UVA representative are appointed for two-year terms. Meetings are held on Tuesday nights beginning at 6:00 PM in Lane Auditorium at the Albemarle County Office Building. Members of the public may make a comment in the form of three-minute speeches at the start of every meeting. It is up to the Chair whether to take public comment during work sessions, though most generally do. From Albemarle County's website: "The duties and functions of the Albemarle County Planning Commission are to promote the orderly development of Albemarle County and its environment.The Commission serves primarily in an advisory capacity to the Board of Supervisors in accomplishing the objectives of Â§15.2-2210 of the Code of Virginia.This Commission also serves to improve public health, safety, convenience and welfare of County citizens and to plan for the future development of the County to the end that transportation systems be carefully planned; that new community centers be developed with adequate highway, utility, health, educational, and recreational facilities; that the needs of agriculture, industry and business be recognized in future growth; that residential areas be provided with healthy surroundings for family life; that agricultural and forestal land be preserved; and that the growth of the community be consonant with the efficient and economical use of public funds." According to County Code, Commissioners are charged with promoting "the orderly development of Albemarle County and its environment." They make $4,100 a year, and whoever serves as chair gets an extra $1,500. ↑ Web. , January 7, 2016, retrieved January 25, 2019. ↑ Web. County of Albemarle, Albemarle County Board of Supervisors Minutes, Albemarle County Board of Supervisors, Albemarle County, January 6, 2016, retrieved January 25, 2019. ↑ Web. Albemarle County Board of Supervisors Appoint New Planning Commission Members, Press Releases, Albemarle County, January 7, 2016, retrieved January 8, 2016. ↑ Web. Planners Study Fire Protection, Staff Reports, Daily Progress Digitized Microfilm, Lindsay family, April 1, 1948, retrieved April 1, 2016 from University of Virginia Library. Print. April 1, 1948 page 8. ↑ Web. Saving Seen in Highway Zoning, Staff Reports, Daily Progress Digitized Microfilm, Lindsay family, April 6, 1948, retrieved December 24, 2016 from University of Virginia Library. Print. April 6, 1948 page 3. This page was last edited on 25 January 2019, at 23:01.